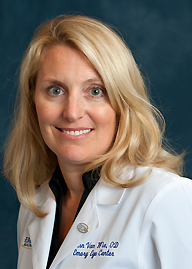 Ann M. Van Wie, OD, FAAO, is an assistant professor in the Department of Ophthalmology within Emory University's School of Medicine. She serves in the Vision & Optical Services within the Comprehensive Ophthalmology section at the Emory Eye Center. Dr. Van Wie received her doctorate from the Illinois College of Optometry. She completed her residency in Atlanta, then served as staff optometrist and chief operating officer at the Northwest Eye Clinic in Minneapolis. Dr. Van Wie returned to Atlanta to join the Emory Eye Center in 2000. Dr. Van Wie provides comprehensive eye exams, prescribes glasses and contact lenses at both The Emory Clinic, Building B on the main campus and at The Emory Clinic Perimeter. She also provides follow-up for those having refractive surgery (Emory Vision) at the Perimeter location. Dr. Van Wie is a member of the American Optometric Association, the Georgia Optometric Association and the American Academy of Optometry where she earned her fellowship in 2005. She has been board certified in optometry since 1994.